Berea, KY, population 15,000, sits right in the middle of the Bluegrass State. It is home to both an organization called Fahe and Grow Appalachia, a program run through Berea College. The two groups have similar missions because they are fighting the same fight – they are trying to rebuild one of the poorest regions of America. Grow Appalachia is a bit more precise. 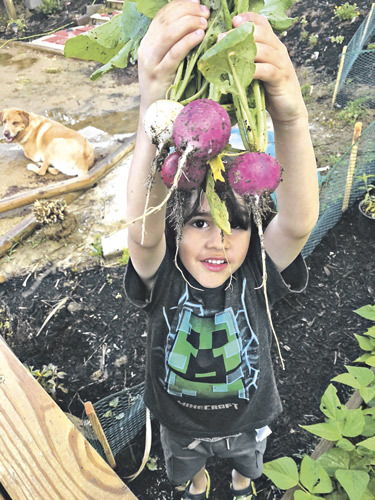 “We focus on many levels of food security because we see food system development as an opportunity that crosses many sectors,” its mission states. “Our approach to food security in the region: Gardening resource distribution and technical assistance; agricultural curriculum and hands-on training; high tunnel infrastructure and protected growing systems; and economic development and beginning farmer assistance.” In short, its goal is to partner with communities throughout central Appalachia to combat food insecurity and malnutrition. At the time of the writing of this story, the partial government shutdown of 2019 is well into its third week. News outlets reported food pantries were opened to federal workers who were going without their first paychecks of the new year. In Appalachian Kentucky, those who are underemployed or underpaid tend not to be so fortunate. Grow Appalachia came into existence to provide not only fresh food but new skills and sources of income to those who truly need them. According to Fahe and the Appalachian Regional Commission’s 2010-2014 Poverty Rate Report, the poverty rate in the combined Appalachian regions of Alabama, Kentucky, Tennessee, Virginia and West Virginia was 19.7 percent, compared to 15.6 percent nationwide. Appalachian Kentucky has been dealing with a poverty rate of 25.4 percent, and a per capita income which is 20 percent lower on average than the rest of the country. Being able to afford fresh produce at the grocery store might not be a priority when you’re struggling to keep a roof over your head. That’s where the small farms – and the skills to farm them – come into play. Cooke noted that Grow Appalachia will working with new growers in four states this year, but have been in six states in the past. They’ll be at 26 sites, but have been in up to 40 in the past. He happily reported that through this program, they’ve been creating about 100 jobs a year for the past 10 years. “Some places get really good at this and don’t need us anymore,” he said. Grow Appalachia partners with small, rural nonprofits to get new gardens and growing centers up and running and manufactures and erects high tunnels for those looking to produce food for themselves or for market. 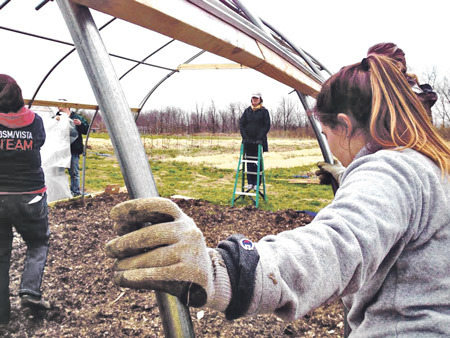 Kayla Preston, the social enterprise manager for Grow Appalachia, and Terra Cash, the high tunnel assistant, build the high tunnels for the folks who live within 100 miles of Berea. Those who invest in a high tunnel are also provided with a production plan. For the most part, about half of the start-up cost for a high tunnel is paid for with EQIP funding from the USDA’s NRCS, with the remainder of the investment paid off in a couple of years, according to Cooke. In addition to the funds raised from the sale of high tunnels, Grow Appalachia sells trucks’ worth of organic fertilizer created by their new farmers as well. The start-up funding for the program came from an unlikely source, though – John Paul DeJoria, best known as a co-founder of Paul Mitchell hair care products and the Patron Spirits Company. Today, the program still receives some funding from DeJoria, along with money from the USDA, the states it works with and other private donors. USDA funds are now even being used to build field kitchens for communities to use. “It’s a community economic driver,” Cooke said of Grow Appalachia. And 10 years in, it’s not slowing down. Current Grow Appalachia partners include Over-the-Rhine People’s Garden, Magoffin County Extension, Wise County Extension, Williamson Health and Wellness Center, St. Vincent Mission, Scott Christian Care Center, Red Bird Mission, Step-by-Step Big Ugly, Rural Resources, Linwood Community Daycare, Pine Mountain Settlement School, Laurel County African American Heritage Center, Highland Educational Project, High Rocks, GreenHouse17, Cowan Community Center, Hindman Settlement School, Build It Up East TN, Glades Community Garden and Appalachian Sustainable Development. To learn more about Grow Appalachia and its programs, visit growappalachia.berea.edu.